Ara-yo-yo-yo(t): Here’s the rundown for this past weekend and the second week of the session. 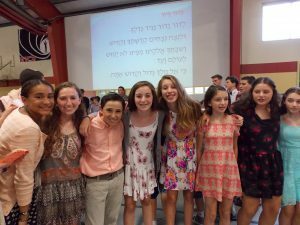 We welcomed in Shabbat with songs and excitement, as the anticipation of a thrilling open week cam e to a close. The chanichim (campers) enjoyed a spiritual kabbalat shabbat and ma’ariv before diving into endless bowls of chicken noodle soup, challah, and chocolate cake for dessert. Afterwards, aydat (unit) Arayot was able to join upper camp for a heartfelt zmirot (songs) session before engaging in a mosh pit filled with shouts and laughter (and sweat, too). Saturday was cool and fun. The chanichim were able to walk around, relax, and play sports throughout most of the day before coming together for a tasty meal of lasagna in preparation for the fast of Tisha B’Av (the ninth day of Hebrew month of Av). Accordingly, the fast started after dinner and the camp came together for havdallah and then a reading of eicha (the Book of Lamentations, which is traditionally read on Tisha B’Av) before the night’s end. Since camp collectively observes the fast day, we had plenty of pensive reflection time offered to both fasting and non-fasting campers. Finally the fast concluded, and the chanichim all were able to enjoy salmon, garlic bread, and cheesecake. 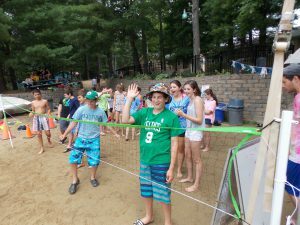 Monday brought forth some summer love and sunshine for the camp, as the chanichim celebrated yom Yisrael (Israel Day) and participated in numerous Israeli themed activities, Israeli history lessons, a shuk (Israeli marketplace), and a pita and falafel-filled lunch. At night, the mishlachat (Israeli delegation) put together a tekes (performance) that featured a song or dance from each aydah, several videos, and metric tons of Israeli pride. This week, the chanichim will have the opportunity to work with basketball coach Rudy, who visits Machaneh Yavneh every summer. And, the chanichim are really looking forward to their first overnight as an aydah this Thursday to Mt. Monadnock. Check back in on Friday to see how much fun we had!